Rain. Thunder possible. Morning high of 64F with temps falling to near 50. SSW winds shifting to NNW at 10 to 20 mph. Chance of rain 100%. Rainfall near an inch..
An iconic Vietnam War photograph shot June 18, 1965, by the late Pulitzer Prize winning photographer Horst Faas that is captioned as an unidentified American soldier of the 173rd Airborne Brigade is anything but that to Fran Chaffin Morrison of Percy and her children. 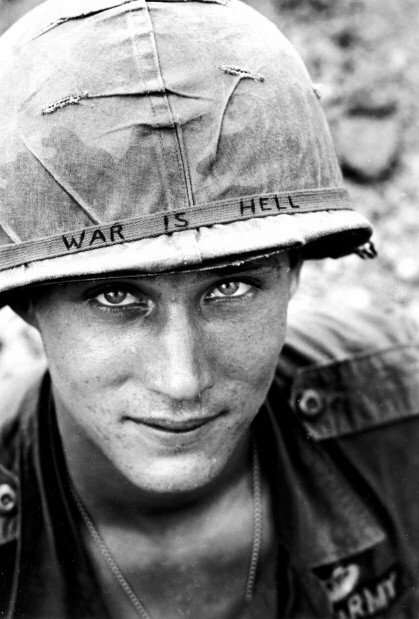 She claims the photograph taken in 1965 of the young soldier with a handwritten “War is Hell” message on the band around his helmet is her late husband, Larry Wayne Chaffin, who served with that brigade in Vietnam for exactly one year beginning in May 1965. “It’s almost like his ghost pops up saying, ‘When are you going to put my name on my picture?’” Morrison said about a concerted effort she and other family members are undertaking now to get Faas’ picture accurately identified. Among other viewings, the picture was prominently shown on a Stars and Stripes news publication; been included within a Time Home Entertainment publication “Visions of the ‘60s: The Images That Define the Decade,” and most recently in the latest “Men In Black 3” movie. It is also the book cover jacket illustration of “Acts of War: The Behavior of Men in Battle,” by Richard Holmes in 1989. Recently retired Associated Press editor Richard Pyle who joined the AP’s Vietnam War staff in August 1968 knew and became good friends with Faas, writing his obituary for The AP when Faas died May 10 and also writing a remembrance of his friend for the New York Times Magazine shortly thereafter. “I never had a conversation with him (Faas) about that specific picture,” Pyle said, noting that he and Faas co-authored a book “Lost Over Laos,” published in 2004 about four combat journalists killed during the 1971 U.S. invasion of Laos. Upon an inquiry from Pyle on Friday, AP Director of Creative Services Chuck Zoeller checked the AP photo archives and reported Faas said in his caption that the unidentified Army solider picture was shot June 18, 1965, and the soldier was with the 173rd Airborne Brigade Battalion on defense duty at Phouc Vinh airstrip in South Vietnam. “That’s probably sufficient. That’s your guy,” Pyle said. What likely intrigued Faas about the subject he was shooting was the headband message, “War is Hell,” that typified an acerbic attitude of many young American soldiers who were likely drafted and sent to the remote southeastern Asia jungles to engage in deadly and terrifying combat, Pyle said. “A lot of guys wrote graffiti on their helmets with inscriptions of their attitudes about where they were and why they were there,” Faas said, noting it was highly evident and scary to war correspondents like him and Faas as they joined soldiers in developing tough behavioral cores like “swashbuckling pirates” to survive. The same picture was printed a few weeks later with Chaffin’s name in the St. Louis Post-Dispatch in a special ongoing section about servicemen returning home from duty, she said. “Without a doubt, we can prove this photograph is Larry Chaffin,” Morrison said. Like their mom, some of Chaffin’s children have encountered running into the iconic Vietnam War photograph when they least expected. Belinda Glander was working as a magazine distributor for Walmart in Sparta and Chester and saw the photograph when she was delivering the Time publication in November 2010. Other Chaffin children, including Cassie Morrison and Larry Chaffin Morrison, recollect the picture being mentioned by their father at various times as they were growing up. “I remember growing up with the picture,” Cassie Morrison said. A grandson, Marcus Glander, 20, looks eerily like his grandfather who was 19 when Faas shot the photograph. Larry Wayne Chaffin was raised and attended high school in the St. Louis area. He met his wife while stationed at Fort Gordon, Ga. 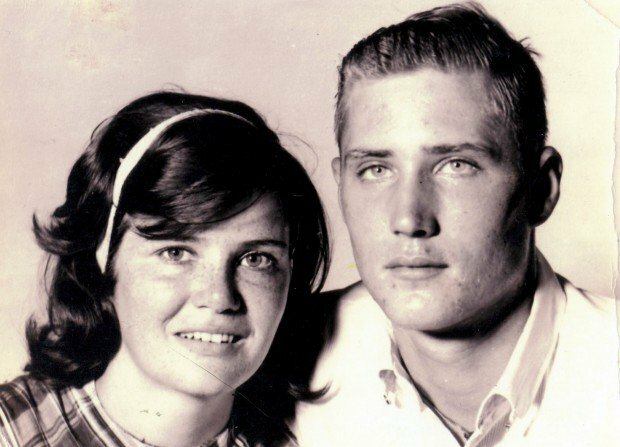 They were married in South Carolina in October 1963. He was 17. She was 16. After his discharge from Fort Sill of Lawton, Okla., they moved to St. Louis and eventually settled in Southern Illinois to be near relatives. Chaffin had many problems adjusting to civilian life when he returned from Vietnam. He died at the age of 39 from complications that arose from diabetes, an ailment he might have contracted from exposure to Agent Orange while serving in Vietnam. He died Dec. 3, 1985, and is buried at Jefferson Barracks National Cemetery in St. Louis, Morrison said. “All we want is a name attached to that picture. It’s kind of disheartening,” said Larry Chaffin Morrison. Pieces of the puzzle are coming together for Melinda Chaffin Keiser of Somerset, N.J.
His eye's caught me and just wanted to know that he lived and glad that he had his own family. He will be remembered. That was the only way I found out who he was and what happened to him. I was very happy to see he survived the war and got home but then saddened to read he still died young. I agree his name should be on this photo where ever it is used. I had to Google asking photo of soldier of Nam, helmet message on it. This face represents the face of thousands of our young that were sent to that cursed conflict, and 58,000 never came home. A worthless war, and a tragic waste of life! It looks like a woman to me. look at the clavical bone ond the cheeks. There's something about those eyes. My thoughts exactly. I was so captured by the young man's eyes that I nearly missed the William Tecumseh Sherman quote on his helmet.